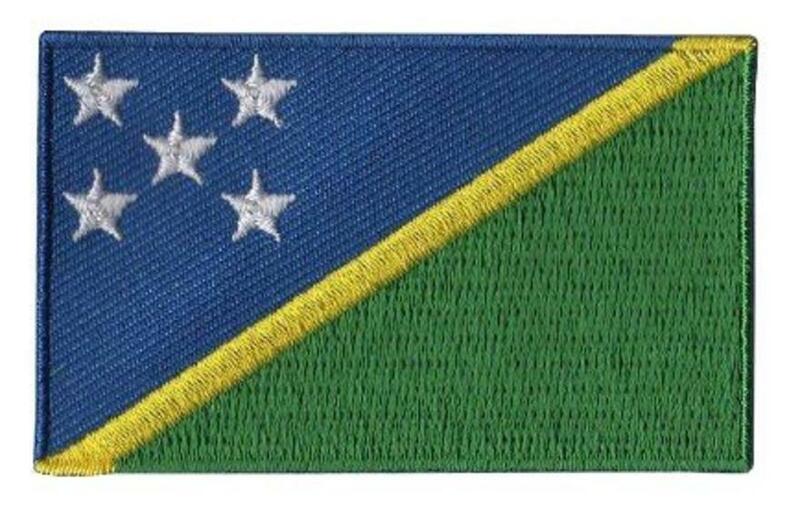 The flag of the Solomon Islands consists of a thin yellow diagonal stripe that separates the flag into two sections. The top portion is blue and the bottom section is green. In the blue section there are five white, five pointed stars arranged in an x pattern. Meaning: The blue section represents the water of the Pacific Ocean; while the yellow stripe symbolizes the sunshine and the green section stands for the fertility of the nation. Originally, the five stars represented the five administrative districts at the time of Solomon Island's independence. When the number of districts in the country increased the meaning of the stars was then said to represent the five main groups of islands groups that form the Solomon Islands. History: The flag of the Solomon Islands was adopted on November 18, 1977, just before the country gained independence from Britain on July 7, 1978.